Runt of the Litter: Just leave me some ammo, a little water, some chips if you have 'em. 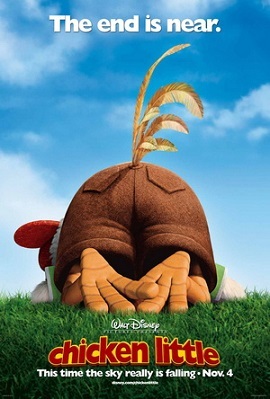 Ace - Hollywood Chicken Little: Runt! Are you all right? Hollywood Runt: No, no. You gotta go on without me, Commander. Just leave me some ammo, a little water, some chips if you have them. Runt of the Litter: This is amazingly accurate. Buck Cluck: I'll see ya later! Remember, lay low. Chicken Little: Yeah. Okay. Bye. Runt of the Litter: Curse these genetically tiny legs! [after Abby gets hit by a dodgeball] Chicken Little: That does it! We were in a time-out, Foxey. Prepare to hurt, and I don't mean emotionally like I do! Tina - Alien Mom: Seriously, honey, someday it's gonna hit somebody on the head. Melvin - Alien Dad: Ah, nonsense. Tina - Alien Mom: Uh-huh. You can't return the panel, can ya? Melvin - Alien Dad: Now-now that's ridiculous. Tina - Alien Mom: Uh-huh, you threw away the receipt again. Melvin - Alien Dad: [using the big voice] Silence! Tina - Alien Mom: Melvin, did you just try and use the big voice on me? Melvin - Alien Dad: Umm... mm... umm... Who're we talkin' about? Alien Cop: Okay, everything's been put back to normal, except for this one over here. Foxy Loxy: [dressed in a pink dress and curls] Hi, y'all. Alien Cop: She got her brainwaves a little scrambled during reconstitution, but, no worries! We can put her back the way she was. Runt of the Litter: No! She's perfect. Runt of the Litter: Lollipop. Foxy Loxy, Runt of the Litter: Lollipop. Chicken Little: His name is Kirby? Abby Mallard: They left him behind? Runt of the Litter: Darth Vader's Luke's father? Chicken Little: Runt, just do it. It'll work. We'll survive! Runt of the Litter: I will survive? Brake, Abby! Mr. Woolensworth: Fish Out of Water. [fish blubs, clicks his tongue, and goes back to his seat] Quite. Buck Cluck: There, how did you get over there? Chicken Little: Who we talking about? Mr. Woolensworth: Henny Penny. Ducky Lucky. Fuzzy Wuzzy. Morkubine Porcupine. Runt of the Litter: Oops, dropped my pencil. Runt of the Litter: GET THE DUCK OUT! Dog: Well, at least we can sell the video to "Chickens Gone Wild." Abby Mallard: Hey, remember when that icy blue stuff fell from the sky? Everybody thought it was from space and stuff, and it just turned out to be frozen pee from a jet airplane. Runt of the Litter: What, pee? Abby Mallard: How 'bout tinkle? Runt of the Litter: Piddle? Runt of the Litter: Wee-wee? Runt of the Litter: Make pishee? Chicken Little: I don't care what it is! Chicken Little: [to the aliens] So... have you been to the mall? Abby Mallard: What's that noise? Runt of the Litter: Sorry. Nervous eater. Foxy Loxy: Go back! Run back! You're never gonna make it! Chicken Little: Don't tap the glass, they hate it when you do that. Chicken Little: A piece of the sky? Shaped like a stop sign? Not again! Abby Mallard: Now THAT'S closure. Mr. Woolensworth: Yaah! You mustn't sneak up on me, Ugly - er, Abby. Buck Cluck: [from trailer] Son, there's something I want you to know. Buck Cluck: In about 3 seconds, I'm going to scream like a little girl! Abby Mallard: or keep searching for Band-Aid solutions and never deal with the problem? Runt of the Litter: Pfft! Band-Aid solutions! Runt of the Litter: Well, I'm sorry! I'm very bad at reading facial cues. Mayor Turkey Lurkey: [to an alien] Oh, we surrender! Here, take the key to the city! Mayor Turkey Lurkey: [holds up another key] Key to my car? Mayor Turkey Lurkey: [holds a box of Tic Tacs] Tic Tac? Goosey Loosey: It is like War of the Worlds outside. Buck Cluck: Oh, no, no, not the book! How many have seen "opening the book" before? Close the book. We're not doing that. Here's what we're gonna do. Why don't I just go back to the day things took a turn for the worst. Runt of the Litter: Mom! You leave Barbra out of this! Mayor Turkey Lurkey: [stops a crowd] Oh, look, a penny. Dog: What did he say? Mayor Turkey Lurkey: [reading a sign-holding Dog's signs] There's... there's... it's a... you have to... D'oh... Doo-wah! Chicken Little: Modern Mallard says avoiding closure can lead to molting, and I'm already small and on top of that I don't think I can handle being bald! Ace - Hollywood Chicken Little: [to Hollywood Runt shooting alien spaceships] Give them a taste of the other white meat! Chicken Little: Who are we talking about? Buck Cluck: What, what? You have to go to the bathroom? Buck Cluck: You want juice? Buck Cluck: CornDog? On a stick? Buck Cluck: Want to play some golf? What do you want?